Ten tornadoes hit North Texas that night. The Fort Worth Tornado ripped through neighborhoods in River Oaks, Camp Bowie and West 7th and then right through downtown. The Cash America Building, the Calvary Cathedral and the Bank One Building all sustained damaged. The Bank One building lost 3,000 windows. Two people died while trying to seek shelter. Eighty others were injured. In Texas, we don’t worry about just tornadoes, but also severe lighting, thunder and hail storms that can cause significant damage and even death. Time to get you and your family prepared for the upcoming spring storms. There is not much you can do to prepare for hailstorms, besides keeping your vehicle in the garage all season and walking around wearing a football helmet, but when hail hits, go inside and remain inside until the hailstorm is over. If you are outside, seek shelter under a picnic pavilion, gazebo or sturdy awning or inside a store, bathroom or other structure. Once inside, close the blinds and curtains to protect yourself from breaking glass. If you are in your car, pull over and turn away from the windshield, while covering yourself with a blanket or coat. There are two main types of floods—overland floods and flash floods. In North Texas, our greatest risk is flash flooding. A flash flood occurs when the city’s drainage system cannot drain heavy rains fast enough. Floods happen quickly and are hard to predict. They are the cause of the most weather-related deaths in America—mostly due to people believing floodwaters are passable. Remember—Turn Around! Don’t Drown! It only takes 18 inches of water to float away a regular sedan-sized car. Floods have the potential to contaminate city water supplies, so store enough drinking water for drinking and personal hygiene. The absolute minimum requirement is one gallon of water per person per day. A flood has the possibility to force you to evacuate your home. Download the Red Cross Flood app for flood alerts and to locate your nearest shelter. Lightning is the electrostatic discharge from the electrically charged area between a cloud and the surface of the Earth and occurs in all thunderstorms. On average, lightning kills 300 Americans a year. There are four types of thunderstorms, classified by their severity. North Texas experiences all of them. We are mostly concerned with multi-cell cluster, multi-cell line and supercell thunderstorms—all of which have the ability to produce tornadoes. Prepare for a severe thunderstorm, the same way you a tornado. A tornado forms when updrafts of warm, humid air create a high-speed whirlwind. This rotating whirlwind or rotating cloud then forms a tornado when it reaches the ground. The United States experiences an average 1,200 tornadoes a year, with May through June being the peak time. Oddly, even though tornadoes can occur any time of the day, they most likely happen between 3 and 9 pm. The first thing you need to know is the difference between a tornado watch and a tornado warning. A Tornado watch is when conditions are suitable to produce a tornado. A warning means a tornado has been confirmed in your area. If your area is under a tornado warning, it is time to put your family emergency plan in place immediately. If you are away from a radio or newscast, know the signs of a tornado. 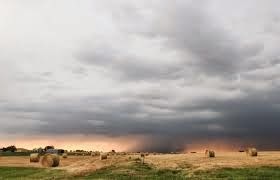 You might see clouds moving towards each other or rotating, flying debris, a green or green-black sky, hail, wall cloud or hear the sound like a freight train. When you see any of those signs, seek shelter right away. To prepare for a severe thunderstorm or tornado establish a “safe room” in your home. If you live in a mobile home—no room inside is safe. For those who live in mobile homes, you should seek shelter elsewhere or build an underground storm shelter outside the home. Your safe room should be an interior room without windows on the lowest floor, and as far away from outside walls as possible. This could be a closet, bathroom or even the room under your stairs. Many apartments and smaller homes have no rooms that have only interior walls. Some experts believe that bathrooms, due to the pipes surrounding it have added protection—possibly more so than a closet. If your bathroom is the only safe room in the house, when there is a threat of tornado, get into the bathroom, and cover yourself with a mattress or heavy blankets. FEMA suggests the room you pick should have enough room for everyone in the family to stand comfortably for two hours. Be sure to accommodate any elderly or disabled family members. If you care for someone with special needs, put a chair in your safe room. Necessary and emergency medications—inhalers, oxygen, aspirin, insulin, EpiPen, etc. 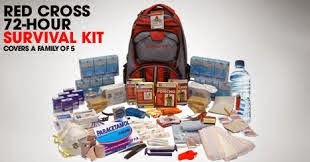 The American Red Cross has readiness items such as signal whistles, flashlights and disasters kits ranging from the basics to a four-person, three-day survival kit. If you are on the road or far from a sturdy structure, do not pull over and hide under an overpass. This is a myth! Experts agree that an overpass is actually one of the most unsafe places to seek shelter during a tornado. Instead, pull over, get in a low-lying area like a ditch, and cover your head. If you absolutely have no other choice but to stay in the car, keep your seat belt on, roll up all the windows, bend down as far as you can below the windows and cover your head with a blanket or any other material you have. For all the information on tornado preparedness, download the Red Cross tornado warning app. We want to hear from you! Share your storm stories in the comment section below.